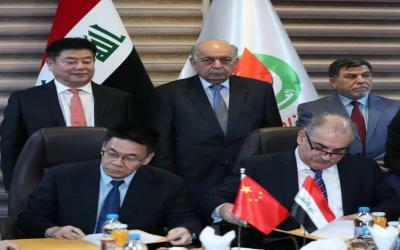 The Ministry of Oil signed a contract with China's Sinoc on Thursday to carry out seismic surveys of two exploration strips, one of them freely in the territorial waters of Iraq in the Gulf, and the other a wild exploratory spot in Faw City. "The ministry is continuing to implement its strategic plans to develop and rehabilitate the exploratory patches to boost the oil and gas reserves by the national effort and in cooperation with international companies," Deputy Minister for Energy Affairs Thamer al-Ghadhban said in a statement received by Mawazine News. This came during a signing ceremony between a contract between the Exploration Oil Company and China's Sinoc to carry out the seismic surveys of two exploration panels. Al-Ghadhban added that "the contract includes the implementation of seismic surveys and the preparation of studies and analysis of the reservoirs of the two exploratory patches, one of which is freely in the territorial waters of Iraq in the Gulf and the second area of ​​land exploration in the city of Faw," noting that "the activity comes to confirm the Ministry's keenness to participate in the national effort in investment projects "He said. He expressed "the hope that the cumulative expectations of the two patches are large, especially that the region where the patches are a promising area of ​​large oil structures." "The signing of the contract with the Oil Exploration Company is an important step for cooperation with the Ministry of Oil in the exploration sector," said the representative of CNOOC, praising the role of ministry officials in creating the right conditions for work. "The company will carry out the seismic surveys of the wild land in accordance with the national potential, while Sinook is preparing studies and surveys of the marine patch," said the director general of oil exploration company Nashwan Mohamed Nouri. "The company has the great expertise in conducting field surveys (3D and 2D) and the preparation of reservoir studies for exploratory patches according to modern technologies. For his part, spokesman for the Ministry of Oil, Assem Jihad, said that "the signing of the studies and geological and seismic surveys for the first exploration activity in the territorial waters, and is an important step on the way to exploration of the oil wealth in the marine patches."